With more than a decade of experience integrating reliable radio communication systems for industrial and hazardous environments, Omega knows exactly what it takes to keep a system running smoothly. 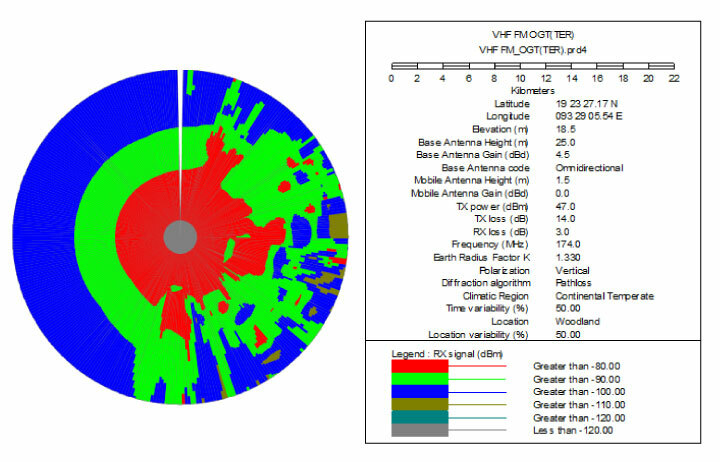 Before system implementation (eg: Trunked Radio System), a comprehensive radio coverage study is conducted to demonstrate the site coverage performance by providing received signal coverage plots. The coverage simulations are based on portable radio subscriber’s type, and evaluated through the use of Pathloss 5 software coverage prediction tool that supported by various data such as receive signal level, site information equipment, environmental parameters and elevation data. The plot is a prediction and the actual performance may vary depending on building density changes. Omega also conducts site surveys to make actual signal strength measurement in order to achieve maximum possible accuracy that meets all your communication needs.